Unfortunately 'The Ambassadors of Death' is one of the casualties of the late 1970's clear-out of the archives. What originally existed as seven 2" Quad colour videotape recordings now survives as six black & white 16mm tele-recordings, with only episode one in it's original form. This story was one of several sold to TV stations in the USA, and colour NTSC Betamax recordings of one of these American transmissions does exist. However, there are many faults with the recordings including interference causing distortion of the colour signal into broad magenta and green stripes, making episode five the only one that is fully recoverable in colour. The process is the same as used on the stories 'The Silurians' 'Terror of the Autons', and 'The Daemons' where the domestic quality colour signal is applied to the broadcast quality black & white film recording. Indeed, episode five of this story was done at the time of these other restorations, but for the video release of 'The Ambassadors of Death' I wanted to start again from scratch in order to gain the best quality from all the surviving elements. Episode one, was cleaned-up last year with with a small amount of noise reduction applied and some re-grading, mostly of the film inserts. There was no reason at the time for this except that I like the story and I wanted to have a go cleaning up the earliest surviving videotape of Doctor Who. I will have a look at this episode again to check the results but for a VHS only release (DVD I imagine being a long way off) it will probably be sufficient. Previously a conversion to PAL of the Betamax recording of Episode 5 had been done from a copy dubbed via 525 NTSC U-matic. While the quality of the colour source isn't particularly high, I wanted to avoid this extra tape generation especially as in this original conversion some of the video signal had been lost in the form of black crushing. 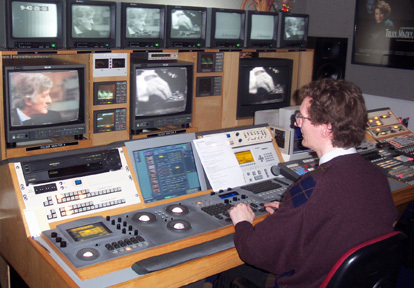 Ralph Montagu (who is overseeing this release) supplied 525 NTSC Betacam recordings which had been made directly from the Betamax tapes, and these were converted onto 625 Digital Betacam. Episodes 5 & 6 were transferred complete with only the usable sections (without interference) from episodes 2,3,4, & 7. Approximately 90 minutes worth of potentially usable colour has been recovered from the recordings. I felt it important that these colour elements and the 16mm telerecordings were treated separately in terms of clean-up before any combining as they both exhibit different problems. Therefore the converted colour source has been re-graded. with heavy use of the DVNR in video mode to cope with the excessive amount of noise from the Betamax recordings. I used the last few shots from episode one as a guide to grading and discovered that the recordings had become incredibly yellow with rather sickly looking skin tones. The Pogle grading system allowed me to correct for this and bring back a much more pleasing picture that matched far closer the kind of colour in episode one. Although the picture now looks somewhat over processed noise reduction wise it doesn't matter because we will only be lifting the colour signal from this to combine with the broadcast quality black & white signal. Having said that though, the cleaned-up Betamax recordings now look remarkably watchable, so hopefully the final results should be very good. 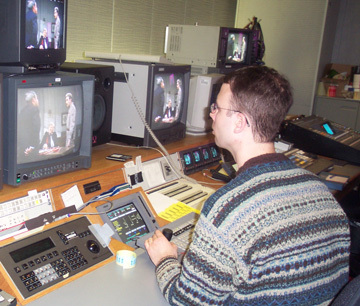 The 16mm film recording negatives of episodes 2 - 7 were transferred on the Spirit telecine at Television Centre onto Digital Betacam videotape. At this stage no noise reduction or shot by shot grading was applied. Film recordings of this age are generally more stable in terms of luminance levels (brightness & contrast) than we would except from earlier 60's examples and setting the levels on one studio shot per episode is usually sufficient. Some of the negatives had the film recording ident intact which includes the date, indicating that they were made on the day of transmission no doubt as each episode was broadcast from the Quad master. The quality of these recordings does vary, with episode 3 being particularly dark (this is probably a dupe neg, rather than an original), episode 6 has numerous line flashes, and episode 7 being very light with many levels bumps on studio and film and an odd sideways shift on one shot. The strange thing is that all these problems are also evident on the Betamax recordings meaning the original videotapes must have had these faults. The second stage of the session was to copy the generated tapes via the grading system, applying some noise reduction and a 4.43Mhz notch filter. The latter is required because the colour subcarrier wasn't filtered out when the film recordings were made. Although the picture is now black & white if it is viewed via composite video on a colour television magenta and green patterning is produced when the PAL decoder detects remnants of the subcarrier. James "Eagle Eyes" Insell noted down any blemishes, Quad problems and other faults not concealed by the DVNR to deal with at a later stage. He is also currently looking at the possibilities of decoding the remaining subcarrier signal on film recordings and reproducing the colour, however results are a long way off. There was a lot of location filming in this story but none of the 16mm film inserts exist, so all we have is what remains in the film recordings. These require additional grading as picture levels do vary greatly and this was also done at the DVNR stage with the exception of episodes 5 and 6. As episode 5 will be fully "colourised" along with most of 6 (as in 1993, for possible use as a source of clips), it will be better to grade these after that stage. Not one of the film inserts throughout the entire story has been film recorded in picture phase so sadly they all suffer from ghosting and blur on motion. One aspect of the restoration of this story that has surprised me is the audio. I had expected there to be original 16mm sepmag soundtracks to go with the negatives but this appears not to be the case, therefore the optical tracks had to be used. While these were being transferred I happened to have the graded colour source tape running alongside at appropriate points. I discovered when switching the audio monitoring between the optical sound and the Betamax recordings that apart from some slight distortion in places the Beta tapes sounded a lot better! So I'm transferring the soundtracks from these domestic recordings onto DAT to apply some straightforward noise reduction, and the results will be laid on to the DVNR masters. Prior to the colour combining sessions all the DVNR masters went through the Scratchbox stage, removing objectionable dirt, sparkle and Quad defects. The amount of film marks and VT faults were about even with the latter usually in the form of bad line flashes. While these faults were not in the same league as something like "The Tomb of The Cybermen", they were still surprising in their number and severity for a 1970 recording. Once episodes 5 & 6 were complete these were transferred to DVCam for Peter Finklestone to VidFIRE™ as these would contain the majority of the added colour. As decisions had not yet been made about colour in other episodes and time was limited only these two were VidFIRE’d. At this time I was processing the Betamax audio recordings in terms of EQ, noise reduction and de-clicking for lay back to these cleaned-up black & white masters. While these domestic recordings aren’t perfect, suffering from some automatic recording level problems and slight distortion (worst in Ep. 3) the results are far superior to the archived soundtracks. For example, during the long film insert in episode 2 of the capsule being transported that background music (which appears throughout the story) accompanies the scene. Listening to the optical soundtrack there is no tambourine audible at all, but now it can be clearly heard indicating the vast improvement in audio bandwidth over the 16mm sound. Certainly now the studio based scenes come to life with a much more "original recording" feel to them. 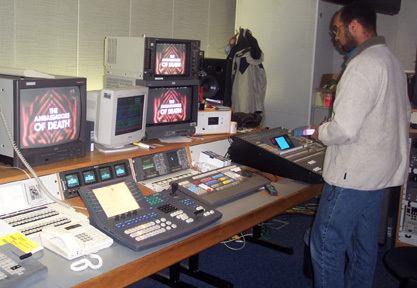 The two combining sessions took place in the BBC’s White City building with editor Rod Hutson marrying up the DVNR/VidFIRE masters with the processed domestic colour recordings. It proved quite difficult to warp the Betamax recording via the Charisma to match closely the distortions on the telerecording of episode 5. Surprisingly though there was another Charisma available at the time of the first session, so the luxury of using two units together - one to match the outside edges and one for the middle (soft wiping between the two) was possible. The results were very good, and at times you can almost believe you’re looking at an original colour videotape recording. The only aspect that betrays the separate origins of the monochrome and colour images is in rapid movement. Then the colour tends to move independently but that’s not really surprising considering the vastly different paths that each element has taken. A test was done between combining the colour with the VidFIRE’d master and also the original film one and it was clear the field by field motion result of Peter’s work did improve the tracking on some movement. Just prior to the compiling of the home video master I took another look at episode one which I’d largely ignored, being retained as an original Quad recording and hence superior to the other episodes anyway. Although I had done some work on it a while ago I soon realised that more was required as there was numerous video dropouts and flashes of a similar type to that seen on the other telerecordings. In the end, it required probably more work than any of the other episodes with more than 500 fixes for various faults. There was a bad Quad off-lock during one of the control room scenes (in all library copies) which has been improved but isn’t invisible. I was also aware that it would have been good to have done some audio cleanup work on episode one, instead a few clicks were removed on the edit to produce the home video master. This is the stage where the many bad vision cuts during all the episodes (possibly physical Quad edits) were tidied up simply by removing the 1-2 affected frames. The master 35mm Jon Pertwee opening and closing titles for 1970-73 were re-transferred on the Spirit telecine for use on this and possibly other stories being re-mastered in the future. Several dynamic grading changes were required in order to get a good colour for Jon’s face in the sequence while at the same time maintaining the usual quality of red at the start. The improved telecine quality and the increased saturation does highlight some of the lesser shades of the graphics that weren’t very prominent when comparing it to the rather shabby transfer at the beginning of episode 1. The result is very similar to that seen on the Spearhead DVD except it should be even clearer being from 35mm. The zooming story title caption sequences (episodes 3-7 only) were also located on 16mm inter-negs allowing for a new transfer of these to be used where appropriate. When episodes 5,6,7 of the story were originally worked on about ten years ago, new end titles in colour were created with electronic captions over the background film sequence. While these were matched using the correct font they did look rather too slick when compared with the original, not incorporating any of the positioning differences between each caption. They were also larger in size than they should have been having been matched to a previously zoomed in 16mm film transfer. So this time I put the end titles from the actual telerecordings into the grading system, crushing the blacks and gamma to improve the chances of keying onto the original captions. The result was grabbed into the frame store of the vision mixer (to remove film weave) and used to key over the newly transferred end titles background. Each of the captions was done in turn with a separate edit, thereby ensuring they cut at the right time. Using episode 1 as a reference, a yellow hue was added to the caption and also a black outline, the result now matching exactly the telerecording but in colour. Episode 5 worked fine, but unfortunately not all of the film recorded end credits were sufficiently good to get a decent key off them. So where necessary the electronic versions were used as the source with adjustment for size and position via a Charisma to more closely match the original. The question of how much colour to include in this video release was a very difficult one, as many of the sections were simply unusable suffering from bad patterning. It has been a process of weighing up the desire to present the story near to it’s original form as much as possible (bearing in mind the poor quality "all colour" bootleg version around) but without distracting the viewer with too frequent transitions to and from colour. Ralph Montagu reasoned that if there was a decent section of colour lasting more than a few minutes then it would be worth having. Also, depending upon where the colour begins and ends would determine how the colour appears. For example, mid scene - a slow gradual bleeding in/out of colour, start/end of scene - coming in or out as a straight transition on the cut. It seemed preferable to include some sections of less than perfect colour bearing in mind that the intended consumer format is only VHS - for DVD it may not have been acceptable. Including episode 1, just over half the story will now be presented in colour. The home video release begins and ends with an extra. The trailer featuring specially shot pieces to camera by Jon Pertwee is at the start, with captions explaining the archive history of the story over the non unique footage and many of the scenes from the story appear without the addition of the incidental music. The end of the tape features a brief illustration of some of the stages involved in the restoration, comparing the results during a scene from episode 5. The amount of work required to bring a seven part Doctor Who story of this vintage up to standard is considerable, particularly considering the number of added stages involved in restoring some colour to these particular archived recordings. Although the results are possibly not quite up to the DVD standards set by the other WHO releases, it has certainly received much more attention than would normally be the case for a VHS release.